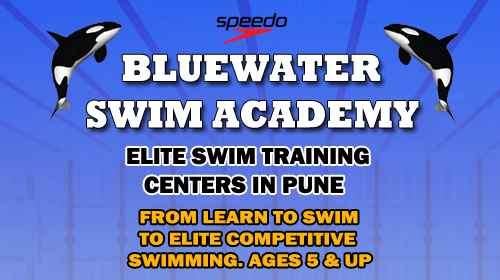 Bluewater Swim Academy, based at 2 locations in Pune is home to one of the most acclaimed coaching and competitive swimming programmes in India. Our mission is to create the opportunity for success experiences in competitive swimming, which range from Olympic dreams at one end of the spectrum to physical fitness and fun at the other. We cater for every level on the development pathway - from learn to swim to elite competitive swimming. Our swimmers generally start in our learn to swim classes, developing life long skills in the water before merging into our competitive squads.